EFree scientists from Carnegie have discovered a new transition metal pernitride, TiN2, which is ultraincompressible (bulk modulus ~360-385 GPa), and potentially a superhard material. Using a laser-heated diamond anvil cell, titanium nitride (TiN) and nitrogen (N2) were compressed to 73 GPa and heated to 2400 K. At these extreme conditions titanium nitride reacted with nitrogen to oxidize the titanium and form a new compound, titanium pernitride (TiN2). This discovery is a part of an ongoing search for new semiconductor materials in the Ti-O-N system that could possibly be useful for photocatalytic water splitting reactions to produce H2. TiO2 is a well-known semiconductor photocatalyst that works in the UV region of the solar spectrum due to its wide band gap (~3 eV). It is established that nitrogen doping within TiO2 reduces its band gap and enhances its photocatalytic properties in the visible light region. But how would these properties change if all of the oxygen in TiO2 is replaced with nitrogen? Although there have been a few theoretical reports that have predicted the crystal structure and properties of TiN2, there has been no experimental evidence to validate these predictions. 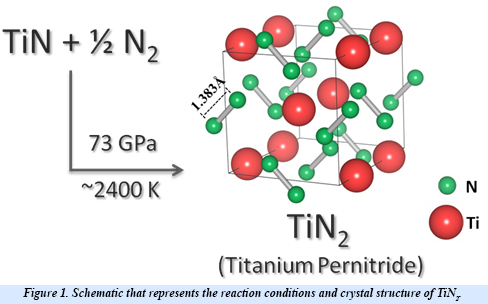 While high pressure and highvtemperature conditions were used for its synthesis, TiN2 is a dynamically stable at ambient conditions and exhibits a unique crystal structure containing single-bonded dinitrogen units (pernitride ions, N24-) and Ti4+. The appearance of single N–N bonds in materials is rare as it requires filling of high-energy antibonding molecular orbitals of dinitrogen. The N–N bond length in TiN2 is ~1.383 Å and is comparable to the F–F single bond length (1.42 Å) in the F2 molecule, which is isoelectronic to the pernitride ion. The filling of antibonding orbitals serves to elongate the N-N covalent bonds and makes the material more resistant to external stress. Several pernitride compounds were discovered previously, but with transition metals belonging to the noble metal group. TiN2 is the first non-noble metal pernitride and the lowest-density transition metal pernitride synthesized to date. relationships. TiN2 is metallic, but its synthesis and properties place important end-member constraints on new photocatalysts in the ternary Ti-O-N system [V. Bhadram et al., Chem. Mater., 10.1021/acs.chemmater.6b00042 (2016)].